After winning the prize in a recent Alheimer’s fundraising event organised by owners of Home Instead, Param and Julie Toor, nurse Mandi Rogers decided to donate some of her prize to raise money for another good cause; the Cystic Fibrosis Trust. Mandi Rogers works in the Children’s ward at New Cross Hospital and was thrilled to receive a beautiful plant, large box of chocolates and a bottle of champagne when she correctly guessed the name of Home Instead’s office (stuffed toy) cat “Simon” at Tettenhall Fete last week. However, she decided that her prize could make a difference to the lives of even more people and therefore decided to pass her prize along to raise money for another cause close to her heart. Photo caption: (L-R) Home Instead Care Manager Kay Kennedy awards competition winner Mandi Rogers with the prize she won at a Home Instead Alzheimer's Fundraising Event. 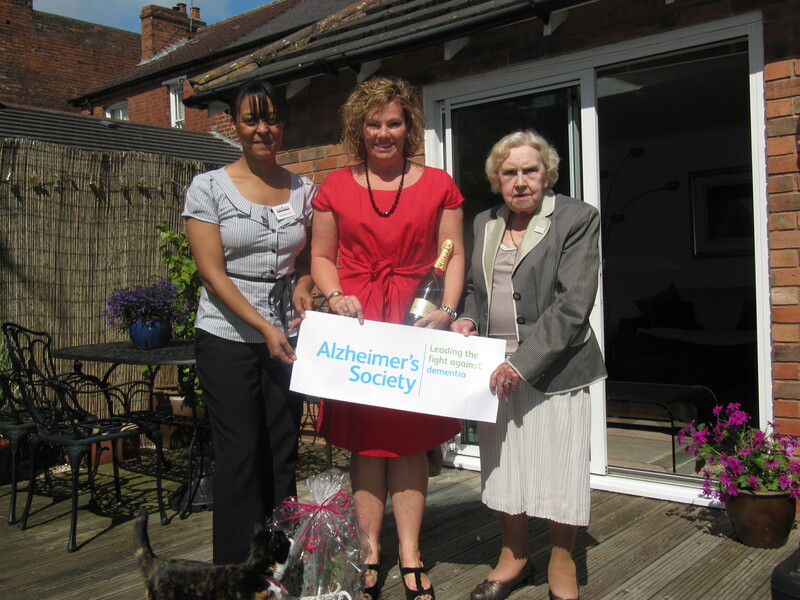 Jean Hipwood who is the chair of the Alzheimer's Society in Wolverhampton makes the presentation to Mandi who has decided to redonate some of her prize to raise money for The Cystic Fibrosis Trust.